Only those who don't know the history of the Farm would be asking about the absence of African-American farmers. It is a statement in ignorance of the history of the Farm and a perspective that has been deliberately foisted to divert us from the issue at stake. 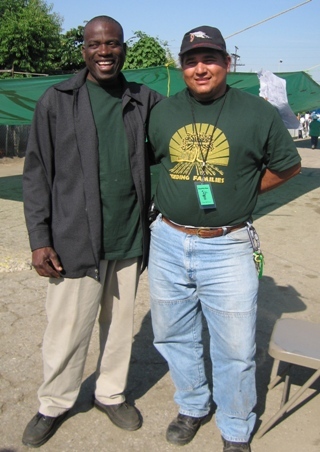 A couple of years ago there was a very important discussion between an alliance which was under the guardianship of an African-American community organizer (Deacon Alexander) and the South Central Farmers where the issue of the involvement was discussed. The decision was left to Deacon Alexander to propose an initiative on how to involve Black farmers on the fourteen acres of land here. To the best of my knowledge, as someone who was intimately engaged in some stages of this discussion, the matter of the movement of Black farmers was completely left to Deacon Alexander. The elected representatives of the Farmers, Tezozomoc and Rufina Juarez, were open and favorably disposed to the inclusion of not just Black farmers, indeed Black women farmers and farmers from all other races, nationalities, and ethnicities. The organizers of the South Center Farmers have been subjected to a vicious campaign of calumny from various sectors. Some of those campaigns of character assassination, we are aware, are funded by those who are opposed to the survival of this largest urban farm in the United States, and we are confident we will overcome this round of the campaign of lies that use the participation of Black farmers as a front. As an Internationalist and a Pan-Africanist, I hold dear the belief that the solidarity of people of color is a necessary and critical ingredient for the liberation of all humanity.